We feel elated in what we do. Our tireless efforts to help people meet complete hearing level in their daily activities. It is our duty to ensure that the hearing process is made simple and easy at the earliest. We stand tall and take pride in supporting our society, especially the Chennai residents in and around the localities – Pallavaram, Chrompet, Hasthinapuram, Chitlapakkam, Nanganallur, Meenambakkam, Trisulam, Pammal, Pozhichalur, Kundrathur and counting – Hearing aid centre in pallavaram. We deliver batteries to hearing aid users in and around a radius of 5 Kms. Awaiting your call to render the best valued hearing care service. We invite our friends and nearby residents to obtain a free hearing loss evaluation and feel the real time benefits of using the Invisible hearing aid programmed to deliver your need. Invisible aids are adaptable to all your daily activities such as walking, jogging, exercising, sleeping, working, meeting, talking and many more. Elite hearing aids, Standard hearing aids, Basic hearing aids from worlds leading hearing aid manufacturers are readily available at your nearest hearing aid store. 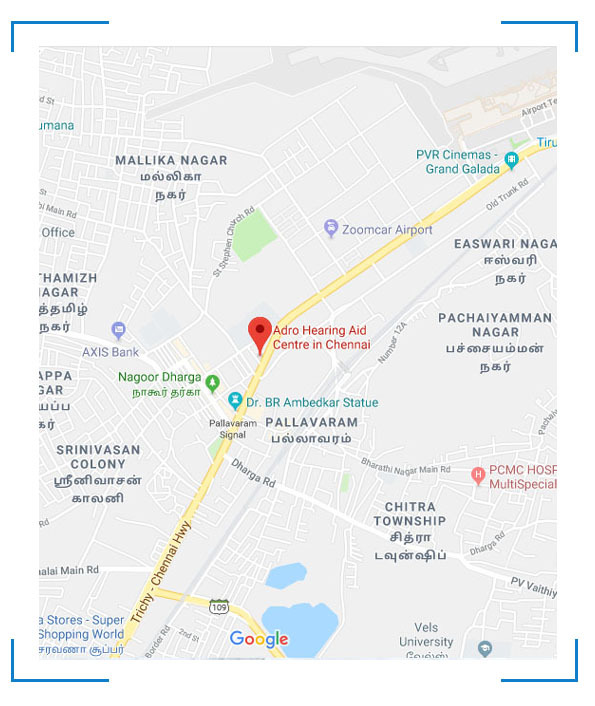 The best hearing aid centre in pallavaram. Walk into our office and experience the rediscovered hearing. Book your appointments now.